This is a detail of this piece by Austrian sculptor Theo Blaickner at the Schillerplatz in Linz, Austria, one of a handful of my personal favorites shots taken in January. 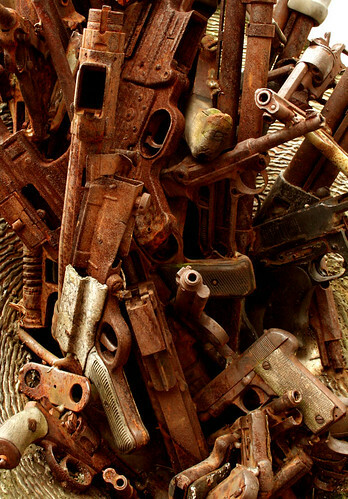 I’m not a big fan of guns but like how they look when very rusty. The rest of my personal faves, shot in Koper and Ljubljana, Slovenia, Linz, Austria, and Stuttgart are here. Linz 009, originally uploaded by pirano. Do you know the title or anything about this piece of sculpture, other than the fact that it was done in 1993. I saw it just last week. i believe that his paintings are equally bad. he is a show off, nothing else. What exactly are you trying to say? 😉 To each his own. I really like this piece.